Renowned for his unabashed love of ornament and theatricality, Tony Duquette’s inimitable design is one of the highlights of Fortuna’s September sale. A well-known painter, sculptor and jeweler, he was renowned for his over-the-top style in interiors, jewelry, costumes, and set design. 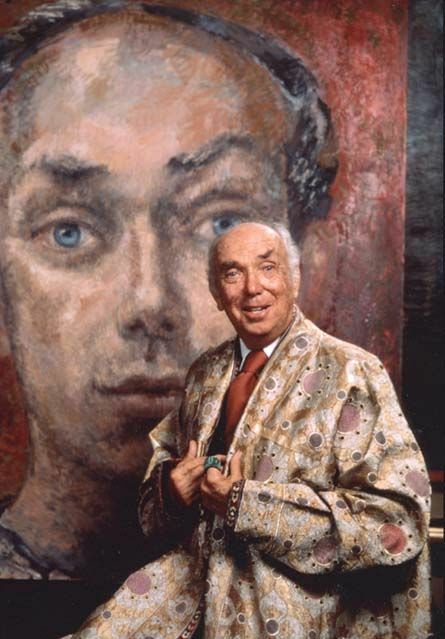 An artist in every sense of the word, Mr. Duquette was known for his maximalist style. With the creation of pieces that are filled with such awe-inducing whimsy and wonder, it is no surprise that this American style icon started his career in costume and set design for theater. As a young man, Tony Duquette was awarded scholarships to the renowned Chouinard Institute in Los Angeles and the Yale School of Theater. Growing to become one of the most recognized LA designers of the time, it was through the patronage of Sir Charles and Lady Mendl, the then international arbiters of taste, that Duquette was able to establish himself as a designer for the film industry. He created both costumes and sets for theater, opera and ballet, as well as many Metro Goldwyn Mayer films. Tony Duquette (1914-1999) earned world-wide fame for his stunning, extravagant designs for stage and film. In 1949 he married the talented artist Elizabeth Johnstone. Their wedding reception included celebrity guests such as Greta Garbo and Fred Astaire, amongst others. In 1951, Duquette was honored by the Louvre Museum in Paris to represent the decorative arts of the middle of the 20th century with a one-man exhibition, becoming the first American to ever receive such recognition. His costumes for the original Broadway production of Camelot garnered him the prestigious Tony Award for Best Costume. The Tony Duquette Studios were also responsible for a myriad of custom interiors for both residential and commercial installations throughout America and Europe. His clients included Elizabeth Arden, the Duchess of Windsor, and Sharon Stone. Tony worked in his 80’s, creating unique fine jewelry for Balmain and Tom Ford at Gucci. While Duquette passed away in 1999, the Tony Duquette Studios continues creating custom interiors, fine jewelry and decorative home products for a discerning clientele worldwide under the direction of Hutton Wilkinson who has been Tony Duquette’s business partner since 1972. 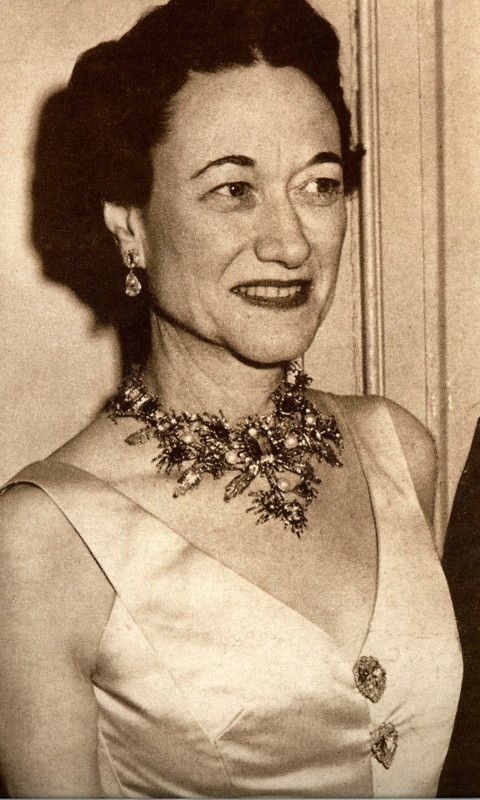 Shown: The Duchess of Windsor, adorned by a floral wreath necklace that Tony Duquette designed for her—a piece that she would wear throughout her life. Fortuna is excited to offer eight pieces that testify to Duquette’s singular style and artistic sensitivity, which has crystalized his work as an American cult favorite. An extremely versatile designer, one can see through this collection how Duquette moves seamlessly between minimalism and his love for the over-the-top. Indeed, the same artist that created the sleek chalcedony and gold necklace with crisp lines and understated use of color, also created the almost larger-than-life, neo-baroque “Memento Mori” brooch complete with a coral scull and petrified wood. Tony Duquette's extravagant celebration of the diversity of world cultures & beliefs. Rooting this collection is the rich history of talismans. Through different cultures and time periods, talisman were held as objects of protection, healing and even magic. Duquette produced what is today the richest work of his jewelry oeuvre – reaching a climax in scale and general eccentricity, the artist produced massive necklaces all filled with a shamanistic aesthetic as exemplified in the tiger’s eye, jade and agate necklace shown in the image gallery below.